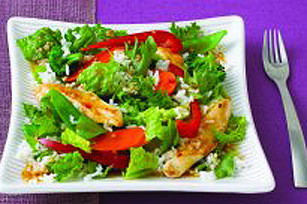 Soy sauce lends Asian-style flavour to chicken strips, mixed vegetables, cooked rice and salad greens in this easy main dish salad. Meanwhile, heat oil in large nonstick skillet. Add chicken; cook and stir 5 min. or until cooked through. Add vegetables; cook an additional 2 min. or until vegetables are crisp-tender. Place rice in large bowl. Add chicken mixture, salad greens, dressing and soy sauce; toss to coat. Substitute 1 pkg. (500 g) frozen vegetable blend for the cut-up fresh vegetables. Excellent source Vitamins A & C, good source Iron, Moderate Dietary Fibre.